Ideal for spaces up to 400 sq.ft. The AeraMax PRO II Small Space Air Purifier cleans the air in smaller spaces such as restrooms, exam rooms and small offices. The True HEPA filter captures 99.97% of airborne contaminants including viruses and allergens and the activated carbon filter reduces odors and VOCs. The AeraMax PRO II works in spaces 150-300 square feet. The patented EnviroSmart technology detects the environment and automatically adjusts performance for cleaner air all the time. Cleans indoor air in public and shared spaces such as restrooms, childcare facilities, waiting rooms and other areas of high concentrations of people. True HEPA filtration captures 99.97% of airborne particulates including bacteria and viruses. Patented EnviroSmart sensor automatically adjusts to optimize performance in response to airborne contaminants and/or room occupancy. Activated carbon filter adsorbs wide range of chemical contaminants and odors. Optional PlasmaTrue Bipolar Ionizer renders bacteria, viruses, and mold inactive. Filter replacement indicator lights . For spaces ranging from 300 to 700 square feet. Professional installation suggested. 5 Speed Air Delivery up to 220 CFM. Vandal resistant reinforced housing. 5 Year Limited Warranty. The Brondell O2+ Balance Air Purifier is fully adjustable to your needs, any time, any season. With its three-stage advanced purifier system, the O2+ Balance eliminates allergens such as dust, smoke, pollen (including tree, grass, and ragweed), pet dander, mould, odour, and harmful VOCs. The certified True HEPA filter removes 99.97% of particulates and allergens above 0.3 microns while the granulated activated carbon filter effectively reduces smoke, foul odour, and harmful off gassing VOCs including Formaldehyde and Benzene. The simple intuitive touch panel makes it easy to control your personalized settings and the Balance comes with the added convenience of a wireless remote control. The air purifier features four distinct operating modes and includes an air quality indicator which automatically adjusts the machine to match the air quality in the room. With its sleek compact design, the O2+ Balance is ideal for any home or office. The elite collection incorporates both form and function to provide a superior air cleaning system. The simple, stylish design looks great in any home environment. Wi-Fi control from smartphone lets you manage your home environment from anywhere 24/7. SmartAQM and auto mode adjust speed to optimize room air quality. UV-C goes beyond filtration to attack bacteria and viruses. UV-C light is a chemical-free way to reduce the spread of germs on surfaces, in the air or water and is often used by hospital and water treatment plants. Common household allergens can trigger an allergy or asthma attack. HEPA filters trap 99.97% of particles down to .3 microns in size, reducing the airborne allergens in your home. Activated carbon filter captures odours created from cooking, pets and smoke. 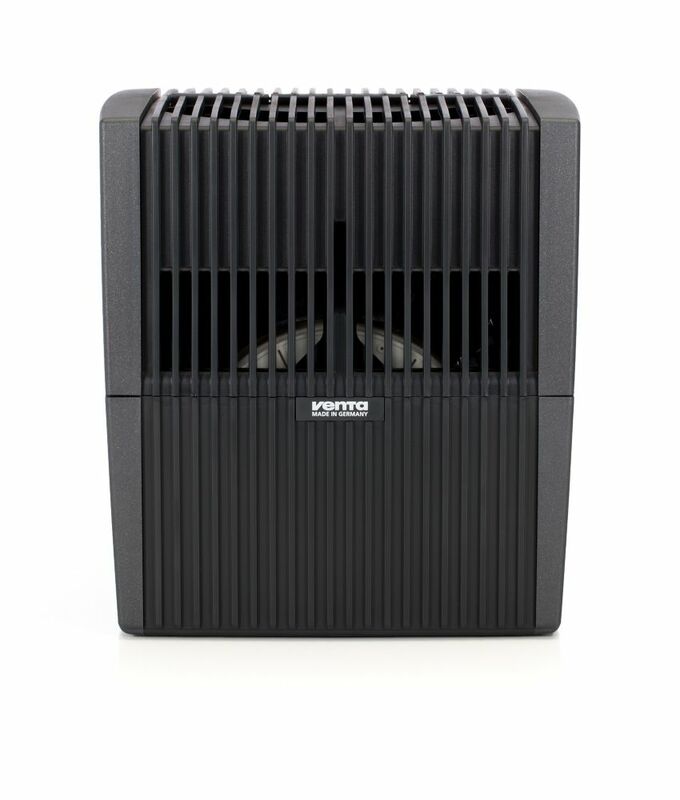 2-in-1 Evaporative Humidifier + Air Purifier With its sleek construction and high-efficiency, the Airwasher is the most powerful 2-in-1 humidifier and purifier on the market today. Every Venta Airwasher incorporates our revolutionary Cold-Water Evaporation technology and operates with a whisper-quiet, multi-speed motor, putting the perfect amount of humidity in the air without white dust or mold. Simultaneously, the Airwasher removes airborne pollutants like odours, allergens, dust and dander from the air without the use of filters. With no danger of over-humidification, the Airwasher is designed to run 24/7 giving you year-round perfect indoor air quality. Whether you choose an LW15, LW25 or LW45 Airwasher, rest assured that each model is fully recyclable and is manufactured in a facility powered entirely by wind energy. 2-in-1 Evaporative Humidifier + Air Purifier is rated 4.4 out of 5 by 29. Rated 5 out of 5 by Senior from This is our second Venta humidifier. The first lasted 15-20... This is our second Venta humidifier. The first lasted 15-20 years and only the speed button no longer worked. It is ready to use from the box; no filters to buy; efficient design. Just add water daily. Yes, it is pricey, but the German made Venta pays for itself. I highly recommend it. Rated 5 out of 5 by HomeDepotCustomer from Compact but good capacity. Like it much better than the... Compact but good capacity. Like it much better than the heat induced kind where the heating element accumulated lime and hard water minerals. This unit is clean and much easier to add water. Very happy with the investment.